Leveraging the standards of PMI and industry best practices, this book provides a comprehensive step-by-step process for planning and implementing a SharePoint solution. SharePoint is a web application framework and platform that integrates intranet, content management, and document management. It is also an application that enables organizations and project managers in particular, to increase the efficiency of business processes, as well as collaborate and manage information effectively. 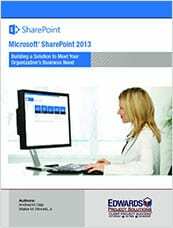 This book is for someone who is a novice user or someone in need of a refresher how to create a SharePoint 2013 environment. The methodology is based upon the recommendations of Edwards Project Solutions and reflects industry best practices. Additional training course material includes: A laminated desktop reference illustrating step-by-step workflow processes and a CD Rom containing resources to complete the exercises provided in the manual.